A couple weeks ago, I was over at a friend's house, and had a quite wonderful beer: New Belgium's Accumulation White IPA. I was taken aback by the wonderful flavour, and quite impressed. I hadn't had a white IPA before, it's actually a fairly new style. Basically it is based on a whitbier style, but with the hop-forward and dry-hopped elements of an IPA. Wonderfully refreshing and cool tasting, and quite drinkable. Probably will be a good summer beer, as most wheat-based beers are. By the time I was done, it was a bit late to deliver the spent grains to my chicken lady, so I waited until the morning. 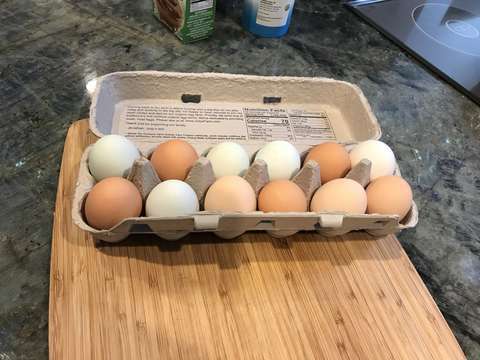 She also requested some finished beer, since her daughter was visiting and likes beer, so Sunday morning I traded some spent grain and a couple beers for a dozen fresh eggs. They are super-yummy eggs! I had a hard time coming up with an apocalyptic-themed name for this one. I started with "Epic Blizzard White IPA", and I still like the idea of a blizzard, but this just wasn't apocalytic enough, so I came up with "Nuclear Winter White IPA". I'm not sure a nuclear winter would really be cold enough to bring to mind the idea I have in my mind, kinda like the movie The Colony. However, I think it works.